Homepage. This page: Gilbern Invader Estate colour photograph. 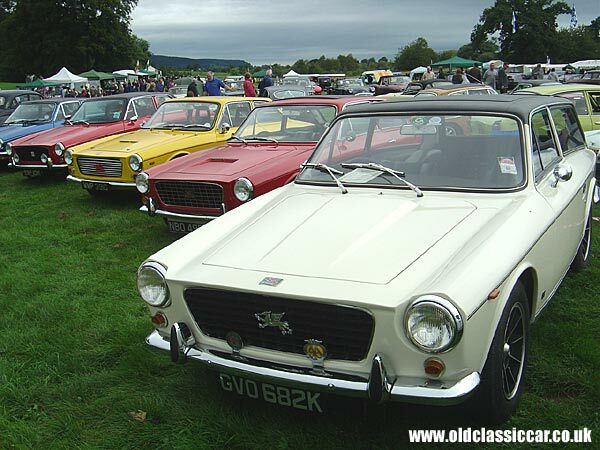 This fibreglass Invader estate car heads up a line-up of Gilberns at a damp Cholmondeley Castle show in 2007. Gilbern Books Whether for the Invader Estate as shown below, or any other type of Gilbern, it is worth having a look on Amazon for books, DVDs, Videos etc. Have you seen today's eBay auction listings for the Gilbern Invader Estate? Picture showing a classic Gilbern, one of 135 images in this set. The Invader Estate, built by Gilbern. First built/registered in the 1970s. Several thousand photos feature in the various galleries here at oldclassiccar. If you're interested in Gilberns, whether just the Invader Estate shown here, or other models in addition to Invader Estates, then it is worth looking at the other photos in this set of 135 motoring images, and also on the main photos page where details of all the image collections are held. Most of the photographs in this set were taken during 2007, either at shows, road runs or in museums. A small number were also sent over to me by visitors to this site, for which I'm very grateful. If you have a photograph that you've taken, showing a vehicle that doesn't yet feature on this site, it'd be great to see it. If you own an example of Gilbern Invader Estate and would like to see it featured in the Your Cars elsewhere on the site, then by all means get in touch too!